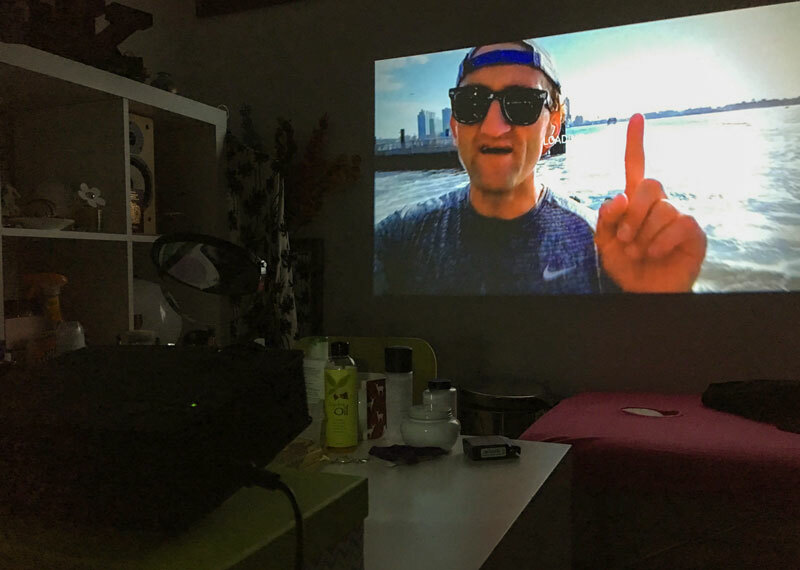 Very few people consider setting up a projector for their house. We’ve had one on the ceiling of the AV Room in the Automated Home since 1999. Back then it was a 50 kilo CRT monster, these days its a much more svelte LCD affair. We’ve toyed with adding projectors in other rooms around the house so when Mpow asked us if we wanted to try one of their Mini LCD Portable Multimedia Projectors we couldn’t wait to get our hands on it. First things first, this is no 4K, or even HD home cinema stunner. While it will take a 1080p feed, it’s an inexpensive 800 x 480 device that you can hold in one hand and take with you anywhere (208mm x 168mm x 78mm – 944g). The box includes the projector, power lead, remote control (batteries not included), an HDMI lead an analog AV cable and a small manual. There’s plenty of I/O – click on the image below – including HDMI and VGA inputs. The projector comes with an 18 month warranty and the 1200 lumens bulb LED bulb is rated for “up to 20,000+ hours”. To test things we plugged in a Chromecast, helpfully there’s a 5v (500mA) USB socket to power it from right on the back of the projector. You can plug pretty much anything in that can output 1080p to HDMI or that has VGA. The built in speaker isn’t something you could practically use, especially over the sound of the fan. We ran a cable from the headphone jack to input of the bedroom Sonos and it was perfect. Using Plex through the Chromecast we watched a few movies as well as YouTube videos and found the image is surprisingly pleasing and totally useable. We just projected onto the bedroom wall which worked great. The specs quote a 32″ image when 1.5m away from the screen going up to a 120″ image at 3m so you’ll need to be back from your wall a bit to get a largest diagonal image. There’s a manual thumb wheel to adjust both focus and keystone correction (this skews the image when the projector is not perpendicular to the screen). The remote control buttons are duplicated on top of the machine too. While this is not a fancy HD machine, with our discount code below its not much more than the price of some smart bulbs. It’s an ideal way to dip your toe in the projector world with some casual movie watching or SD gaming. Here are the details on how to use the 10% Discount code Mpow has sent for Automated Home readers, but be quick as it expires at the end of the week. Just order the machine from Amazon UK using this link then enter the code TCNLDOA3 at checkout (code valid until 30/10/16). 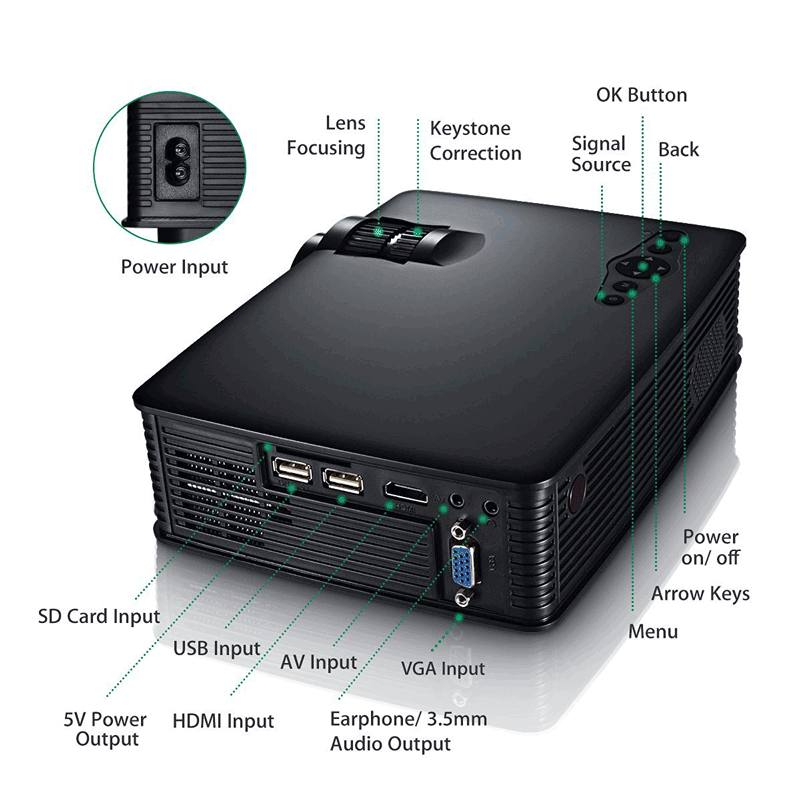 5 Comments on "Bargain: Mpow Mini LCD Portable Multimedia Projector (with Discount Code!)" Review on point, highlighting the actual facts. I’ve this projector, really good for your office or bedroom. Anybody knows how its working temperature is? i have used this project and i can say out of all the budget projectors,this one was the best one i used ,colors are great , resolution is what u expect for the price and worka great with any hdmi device u have..